My Granddaughter is getting at the age that she wants to "help" with everything I do. I think this book will be great for her, so we can talk about the safety issues, as well as give her a variety of ideas, so she can find her own niche in the craft world. I'm a bit of a novice at sewing, so I think this would be a great book to use with my kids, to grow and explore together! I actually don't want to win this for myself (I don't have children of my own). I want to win this for my friends, Stephanie and Tyler, who have 3 kids. I think this is perfect for them as it'll give them some craft ideas for their family time. I love those guys a lot. This book would be great to share with my 3 granddaughters. No time like the present to get them involved in the craft world! This book sounds fun. I'm going to be a grandma in a couple of weeks so I think this book would be great to have in my "grandma library". My niece has 7 children, 4 are girls. I went thru my stash and mailed a BIG box of fabric for the two oldest. This would be a great resource for them! I'd like to win this book because I want to make superhero animal stuffies for my nieces. I love the examples on the cover. I`d make villains exactly like the superheroes, except they`d have detachable mustaches which fall off when they turn away from the DARK SIDE. We have a lot of little ones in the famly and this retired teacher is expected to keep them busy. I need new ideas. 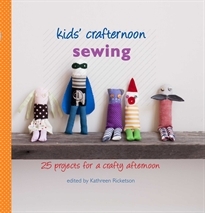 I would love to give this book to my granddaughter so I can encourage her in the crafting experience. She shows great promise but needs a little help.